Produced by the U.S. Smokeless Tobacco Company, Skoal X-Tra Rich Blend is a long cut dip with an extra sweet flavor. I was excited to try it, because I’ve only ever had tobacco flavored dips before and wanted to mix things up a little. Once I opened my can, I noticed a strong aroma which was just like the smell of cough syrup. I wasn’t a big fan of this aroma, so I wasn’t sure what I would expect in terms of taste. After placing a dip in, I noticed that it was quite sugary and sweet, with a hint of cherry. Over time, the flavor began to mellow out, and I really enjoyed the sweet flavor from about ten minutes in and onwards. I didn’t notice very much saltiness in this brand, it was mostly only sweet. I was quite surprised that the flavor was good, because I wasn’t a very big fan of the smell at all. The dip also paired well with different types of soft drinks (root beer and Dr. Pepper especially). Skoal Xtra Rich Blend is a long cut and very easy to pack. I also found it very easy to remove dips even without water because of how well the tobacco held together. The only downside was that I found the nicotine strength to be lower than some other brands out there, so it took more dip to give me a bigger buzz. 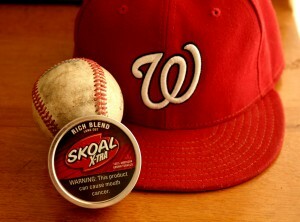 Overall, I feel Skoal X-Tra Rich is one of those brands of dip that you either love or hate. Personally, I really enjoyed the flavor, and it was interesting to see how it developed over time. There wasn’t a very strong tobacco taste in this dip, and I recommend this brand to those who enjoy sweeter flavored dip blends and rich tastes. We carry Xtra Rich Blend on our online dip store, so be sure to pick some up if you’re looking for something sweet!